The sensation of thirst decreases with age, as does the amount of water in our bodies, which makes seniors more at risk for dehydration. 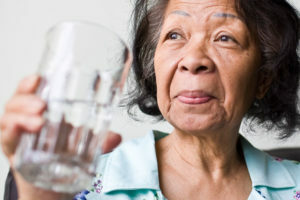 Use these tips to help the older adults in your life stay hydrated. Imagine it’s peak summer and you’ve just finished up working in the garden for two hours, with the afternoon sun beating down on your back. As you walk into the house you beeline straight to the sink. There’s only one thing you can think about: an ice cold glass of water. You most likely know this feeling of thirst – or even of being parched. But as you age, that sense of thirst diminishes. So even when your body needs to be replenished with water, you might not realize it. Because of that, many older adults don’t drink enough liquids. “By the time they are thirsty, that’s already an indication of early dehydration,” says geriatric nurse Anne Vanderbilt, CNS. It’s not known exactly what causes this reduction in thirst, but the consequences of it are well known: Dehydration is a common cause of hospitalization among elderly people. Seniors are also at greater risk for dehydration because of how body composition changes with age. Older adults have less water in their bodies to start with than younger adults or children. Water is necessary for nearly every bodily function, from lubricating joints to regulating body temperature and pumping blood to the muscles. So not getting enough of it can have serious health consequences. Adding to the problem is that symptoms of dehydration in the elderly often go unrecognized, Ms. Vanderbilt says. Many of the earliest signs, like dry mouth, fatigue, dizziness and muscle cramps, are nonspecific and could be easily attributed to other medical conditions, medications or natural effects of aging. Persistent dehydration that causes difficulty walking, confusion, rapid heart rate or other more severe symptoms can land seniors in the hospital. The best way to prevent this is as obvious as it seems – good hydration. The “eight glasses of water per day” rule is a general recommendation that became popular because it’s easy to remember, Ms. Vanderbilt explains – drink eight 8-ounce glasses each day. “But some people definitely can tolerate less, and sometimes you need more, like in the heat if you’re sweating,” she says. If you’re caring for a senior or have an elderly family member who is prone to dehydration, Ms. Vanderbilt offers up these practical tips. Water is best, but we all know that drinking water all day every day can get boring. So try offering your loved one some fruit or flavoring to put in it, or switching it up with some milk or juice. A word of caution on juice, though — a lot of juices are high in sugar, which can especially be a problem for people with diabetes. Ms. Vanderbilt suggests trying a 50/50 mixture of juice and water if you’re going to go that route. Caffeinated beverages like tea and coffee will have a slight diuretic effect, she continues, so while it’s OK to have them in moderation, they shouldn’t be counted toward a daily fluid intake goal. Many foods are also very hydrating, so help your loved one work foods with high in water content into their diet. Help your loved one build hydration into different parts of their day. Encourage them to have something to drink with every meal, for example. They should also be drinking water before and after exercise. Purchase a nice mug, cup or tumbler that your loved one enjoys drinking from and can keep by them all the time. As a final note, people with certain medical conditions like heart failure may have more specific fluid needs. Make sure to consult with a medical professional before making changes to a loved one’s diet or liquid intake.